Congratulations, dear reader! You are giving your attention to the prevailing topic of the times and the subject of this book: an ailing monetary system with all its devastating implications, those already visible and those that are still to come. A key role in the painful and unavoidable process of healing will be played, as in all crises of the past, by gold. Your interest in this matter places you in the group who anticipates and understands that gold must and will once again rise to a central position in a future and sound monetary system within a society based on the principle of honesty. Counterfeit money and money conjured out of thin air, whose primary purpose is to preserve the power of a tiny minority, will inevitably be destroyed. It is self-evident that this not only means social interaction and systems will become healthier again, but also that you yourself will, in the foreseeable future, reap the benefits of your foresight. Those who have only very little means at their disposal for purchasing gold, or none at all, will also benefit. The creeping and ongoing dispossession by devaluing money for the benefit of debtors affects everyone. It is an insidious, perfidious and highly antisocial process that spares no one, is socially reprehensible in the highest degree and, in the long term, always leads to disaster. History is full of examples. The role of the state, once exclusively responsible for internal security and defense, with its meddling in the private lives of citizens, and its ceaseless flow of new controlling measures, is increasing exponentially. Civil liberties are withering. Under various spurious disguises and justifications, fascistic power machines are mushrooming. 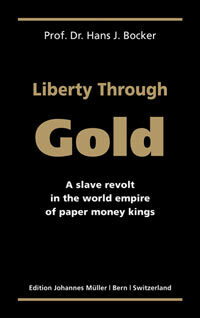 It is hardly surprising that top-ranking financiers and politicians fear gold as much as the devil fears holy water. Returning to a gold standard would mean the end of their power and the end of the dollar. It would mean the end of systematic deception, tampering with balance sheets and concealed fraud. Gold is absolutely honest. This book will lastingly motivate you to think independently. Have courage!